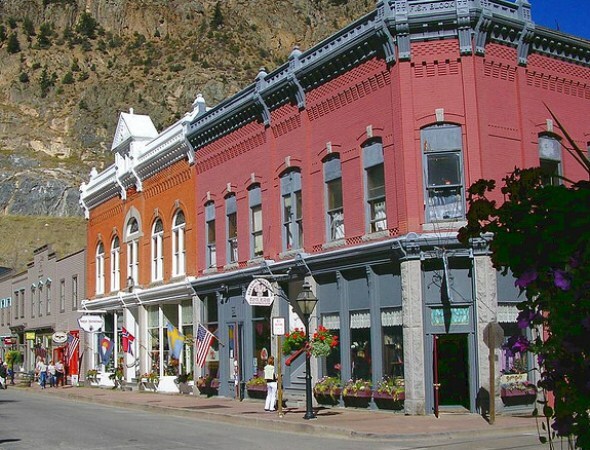 The historic neighboring communities of Georgetown and Silver Plume have evolved from their roots as a gold and silver mining towns into watering holes for skiers returning home from nearby ski slopes and a summer destination for tourists who enjoy walking tours by the many Victorian buildings and a scenic ride on the narrow-gauge loop railroad. Population: 1,034 in Georgetown and 170 in Silver Plume (2010 Census). Land area: 1 square mile for Georgetown and 0.25 square mile for Silver Plume. County: Clear Creek County (Georgetown is county seat). Altitude: 8,530 feet above sea level for Georgetown and 9,114 for Silver Plume.